Karni Bhawan Palace was built by Maharaja Karni Singh, Maharaja of Bikaner, and built in exclusive architecture. It has some high-class Doric pillars, attractive staircases and large windows stand as evidence to the artistic brilliance of the past. While its well-preserved paintings, old photographs of the royal houses of Bikaner and Mewar which cherish the royals in their creation and the period furniture and curious lend a distinctive atmosphere that relaxes the tired guests. It is now converted into a hotel. Karni Bhawan Palace Hotel provides all the amenities and facilities to the guests. Karni Bhawan Palace offers 12 rooms of which 10 are Art Deco Suites and the remaining are regular rooms. Services and Amenities : 24 hour in room dining, Travel Desk, Currnecy Exchange Service, Doctor on Call, Non Smoking Rooms, Restaurants, Audiovisual Equipment’s, WiFi, Confidential Meeting Suite. Manwar Restaurant : Authentic ethnic cuisine is served at Manwar – the word refers to the ‘traditional genteel hospitality celebrated in Rajasthan’ — for guests at breakfast, lunch and dinner, with the gracious warmth associated with royal households. Open for breakfast, between meals, lunch and dinner . Maikada Bar : Maikada – the word means ‘tavern’ – is where guests love to unwind and soak in the ambience of this former royal residence. With drinks and cocktails of your choice, Maikada promises to keep your spirits high. 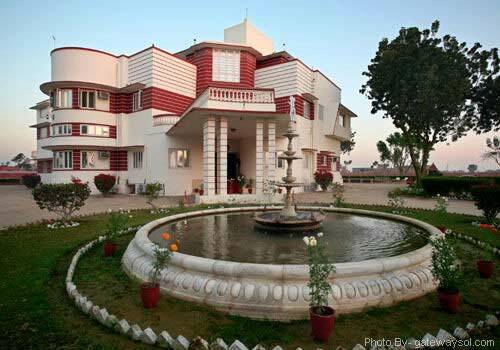 Location: Karni Bhawan Palace is located at just 4 km distance from Bikaner Railway station.